Fusion II - in recommended framing. 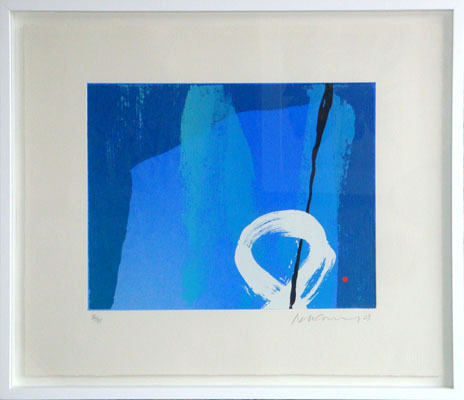 Framing is available in white, black and plain wood - please see our Framing Options page for details. Neil Canning's career has spanned more than 30 years. Initially he followed a traditional path and at the age of 21, ‘Shadows’, a self portrait was included in the Royal Academy Summer Show. This early success continued when he exhibited at the National Portrait Gallery (1987) and the Paris Salon (1994) where he was awarded the Bronze Medal. His connection with landscape has been a constant source of inspiration. Eventually he realised that it was vital for him to develop a more personal voice – to create a distinct visual language. Abstraction now played an important role in the painting process. Moving to Cornwall in 1997 (he had lived in Llanwrda in mid Wales for several years prior to this)proved to be a major turning point and it was at this time his mature style fully emerged. 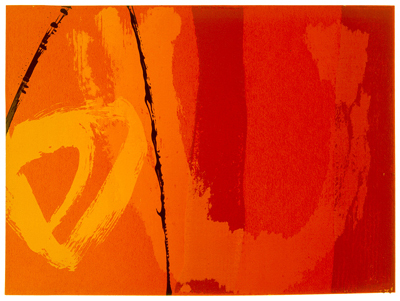 In 2007 his work was included in an exhibition at Tate St Ives, recognising his contribution to the St Ives tradition. Canning's vibrant, dynamic paintings and prints appear in numerous private, public and corporate collections including the United Nations New York, the Ashmolean Museum Oxford, the British Embassy Venezuela and the Bank of England.